"nevermind these walls" is an interactive audio-visual installation in which the listener/viewer travels through the space in which the installation takes place, having a book with blank pages, and a tape recorder with many tapes at hand. 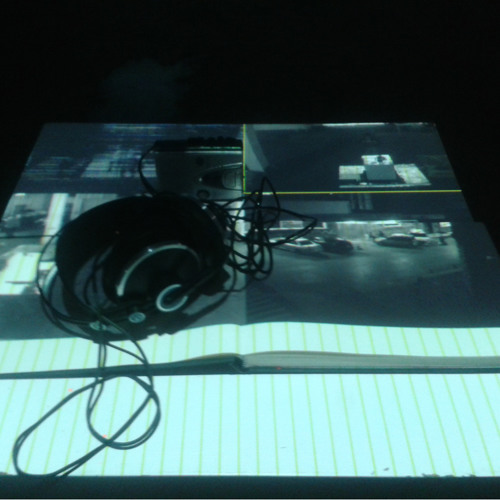 Live images recorded by security cameras placed inside and outside the exhibition space, are projected onto and around the artwork, therefore trespassing the pages. The tapes displayed, include recordings of our work process and become an ongoing recording as some would gradually include recordings of the exhibition days. As the person interacts with the installation by manipulating the tools displayed, a subjective memory of this experience is formed, with raw objective unedited auditory and visual footage and rigid tactile tools, that are soon to be forgotten.